Question: What are a good replacement nib for this marker? Answer: (AP Reply) Sadly, these don/t have replaceable nibs. Question: Is the nib size on this about the same as the mini pilot super color? Answer: (AP Reply) Yes and no. The Pilot has a tapered nib with a thin chisel line. The Mini Pilot has a straight edged nib/ consistent 1/4" wide with the end at an angle. Answer: (AP Reply) I won/t reccommend putting Smash in this marker as you/ll need a pump to help push the pant/ pigments through the valve and nib. If you add a little pilot ink to a pre-existing paint marker like a Unipaint pen you/ll get a cool effect. 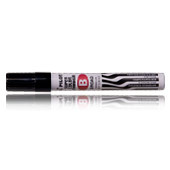 Question: if i use this marker for slaps, will it fade in the sun/rain/time? Question: why dont ya'll carry these in red/blue/green? Answer: (AP Reply) They just aren't that popular.